0:00 After you've recorded audio and video for your scripted recording you can edit the video by clicking this button. 0:06 This brings up the usually recording editor but there are a few special features when you are editing a scripted recording	0:12 First you'll see bars on the timeline that denote where your scripted sections start. 0:18 If you click and drag along the timeline you'll see a tooltip appear which points to the start of the current section and lists the text in that section. 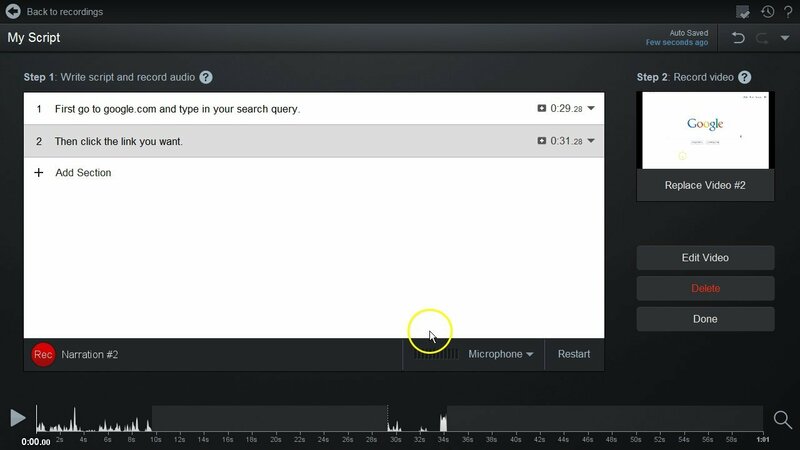 0:27 If your video recording added silence in a script section it will also be highlighted on the timeline	0:33 When you seek within that highlighted part you'll see an icon on the tool bar offering some editing options for the silence. 0:40 You can absorbe the silence which will make the video run faster to match the audio in that scripted section. 0:47 You can cut the silence out. 0:49 Or you can speed-up just the silent part which you can do multiple times if you need more speed. 0:56 If you'd like to add an overlay over a complete section then you can seek to the start of the section and then choose to add the overlay which will default to select the complete section. 1:07 If you need to get back to the script editor you can click the "Edit Script" button to get back.